Imperial Restroom has offices in Texas offering high end luxury shower trailer rentals in Houston, Texas | Shower Trailer Rentals in San Antonio, Texas | Mobile Shower Trailer Rentals in Dallas, Texas | Portable Shower Trailer Rentals in Austin, Texas | Luxury Shower Trailer Rentals in Fort Worth TX | Cheapest, Most Affordable Shower Trailer Rentals in El Paso, Texas | High End Shower Trailer Rentals for Weddings in Texas | Emergency Restroom/Shower Trailer Rentals in Texas | Low Cost Portable Restroom Trailer Rentals in Arlington TX | Affordable Shower Trailer Rentals in Corpus Christi TX | Bathroom/Shower Trailer Combo Rentals in Plano TX | Imperial Restroom Trailer rentals in Laredo TX, Lubbock TX, Garland TX, Irving TX, Amarillo TX, Grand Prairie TX, Brownsville, McKinney, Frisco TX, Pasadena, Mesquite, Killeen, McAllen TX, Carrollton, Midland, Waco, Denton, Abilene TX, Odessa TX, Beaumont TX, Round Rock TX, The Woodlands TX, Richardson TX, Pearland TX, College Station, Wichita Falls TX, Lewisville TX, San Angelo TX, League City, Allen TX, Sugar Land TX, Edinburg TX, Mission, Longview TX, Bryan, Pharr, Baytown TX, Missouri City TX, Temple, Flower Mound TX, New Braunfels, North Richland Hills TX, Conroe, Cedar Park TX, Harlingen, Atascocita, Mansfield TX, Georgetown and many other cities and towns in the Lone Star State. Imperial Restrooms provides the lowest prices for shower trailer rentals and porta potty rentals for large events in Boston, Massachusetts (MA): Portable Shower Trailer Rentals in Worcester, Massachusetts (MA): Mobile Shower Trailer Rentals in Springfield, Massachusetts (MA): Shower Trailer Rentals in Lowell MA | Massachusetts Emergency Porta Potty Rentals and Emergency Bathroom Trailer Rentals | Temporary Restroom/Shower Trailer Combo Rentals for Large Events and Construction Sites | Cambridge MA Restroom Trailer Rentals | Bathroom Trailer Rentals for Weddings in Massachusetts | New Bedford MA, Brockton MA, Quincy MA, Lynn MA, Fall River MA, Newton MA, Lawrence MA, Somerville, Framingham, Haverhill, Waltham MA, Malden, Cape Cod, North Shore of Massachusetts, South Shore of Massachusetts, Medford, Taunton, Chicopee, Weymouth, Pittsfield MA, Attleboro, Arlington MA, Salem, Leominster MA, Fitchburg MA, and many other fine communities in the Commonwealth of Massachusetts. Imperial Restroom pride themselves on providing the cheapest, most affordable restroom trailer rentals in New England as well as the lowest prices for Mobile Shower Trailer Rentals in New England and pride themselves on offering the finest New England Restroom Trailer Rentals. Imperial Restrooms has offices in Florida providing high end and budget shower trailer rentals in Jacksonville, Florida (FL): Bathroom Trailer & Shower Trailer Rentals in Miami, Florida (FL): Largest most elegant, luxury shower trailer rentals in Tampa FL | Emergency Restroom/Shower Trailer Rentals in Florida | Shower Trailer Rentals in St Petersburg FL | Restroom/Shower Trailer Rentals in Orlando FL, Shower Trailer Rentals for Wedding and Special Events in Hialeah FL | Shower Trailer Rentals in Tallahassee FL | Best Shower Trailers in For Lauderdale FL | Affordable shower trailer rentals in Port St Lucie FL | Low prices for high end shower trailer rentals in Cape Coral FL, Hollywood FL, Pembroke Pines FL, West Palm Beach, Palm Bay, Miami Gardens, Clearwater FL, Miramar, Gainsville FL, Sunrise, Pompano Beach, Davie, Miami Beach FL, Deltona Florida, Boca Raton, Largo FL, Melbourne FL, Palm Coast FL, Fort Myers FL, Daytona Beach, Boynton Beach, Plantation, Deerfield Beach and a great many other cities and towns in the state of Florida. Imperial Restrooms Inc is one of the most prolific sanitation contractors in New York offering the most high end, luxury shower trailer rentals in New York City, New York | Luxury Restroom Trailer Rentals in The Bronx | Bathroom Trailer Rentals/Shower Trailers in Manhattan NY | Elegant Shower Trailer Rentals in Queens NY | Shower Trailer Rentals on Staten Island NY | Luxury Shower Trailer Rentals in Buffalo NY | Emergency Bathroom/Shower Trailer Rentals in New York State | Bathroom Trailer Rentals for Weddings in New York | Restroom Trailers for Concerts & Large Events in New York | Mobile Restroom Trailer Rentals in Yonkers NY, Syracuse NY, Albany NY, New Rochelle, Mount Vernon, Utica, White Plains NY, Hempstead Village, Niagara Falls NY, Troy, Freeport, Binghamton and many other cities and towns in Upstate New York. Imperial Restroom has offices in New Jersey offering the most elegant porta potty rentals and restroom/shower trailer rentals in Newark, New Jersey (NJ): Mobile Shower Trailer Rentals in Jersey City, New Jersey (NJ): Portable Shower Trailer Rentals in Paterson, New Jersey (NJ): Bathroom/Shower Trailer Rentals for Weddings in New Jersey | Elegant Bathroom Trailer Rentals in Elizabeth New Jersey (NJ): Cheapest, most affordable portable restroom trailer rentals in Edison NJ | Best in Class Shower Trailer Rentals in Woodbridge NJ | Handicap Bathroom Trailer Rentals in New Jersey | ADA Compliant Restroom Trailer Rentals in New Jersey | Affordable Restroom Trailer Rentals in Lakewood NJ | Long Term Shower Trailer Rentals in Toms River, New Jersey | Finest Bathroom/Shower Trailer Rentals in Hamilton NJ | Trenton NJ Mobile Restroom Trailers | Finest Restroom Trailer Rentals in Clifton NJ, Camden NJ, Brick NJ, Cherry Hill NJ, Passaic NJ, Middletown NJ, Union City, Old Bridge NJ, Gloucester Township NJ | Restroom Trailer Rentals in Every Township in New Jersey. Imperial Restrooms is one of the largest, most prolific shower trailer rentals companies in Pennsylvania offering the finest shower trailers rentals in Philadelphia, Pennsylvania (PA): Mobile Shower Trailer Rentals in Pittsburgh, Pennsylvania (PA): Elegant Portable Shower Trailer Rentals in Allentown, Pennsylvania (PA): Mobile Shower Trailer Rentals in Erie, Pennsylvania (PA): Restroom Trailer Rentals in Reading PA | Bathroom/Shower Stall Trailer Rentals in Upper Darby, Pennsylvania (PA): Scranton PA, Bethlehem PA, Bensalem PA, Lancaster PA, Lower Merion PA, Abington PA and many other fine communities in the Quaker State. Imperial Restroom has offices in Illinois providing the most elegant shower trailer rentals for weddings in the state of Illinois as well as Emergency Bathroom Trailer Rentals & Shower Trailer Rentals to the state of Illinois. For over a decade, Imperial Restrooms has been offering the cheapest, most affordable bathroom trailer rentals in Chicago, Illinois (IL): Mobile Bathroom/Shower Trailer Rentals in Aurora, Illinois (IL): Elegant Portable Restroom Trailer Rentals in Rockford, Illinois (IL): Cheapest, most affordable bathroom trailer/shower stall trailer rentals in Joliet IL, Naperville IL, Springfield IL, Peoria IL, Elgin IL, Waukegan IL, Cicero IL, Champaign IL, Bloomington IL, Decatur IL, Evanston IL, Schaumburg IL and many other fine communities in The Prairie State. Imperial Restroom has office in Georgia providing first-in-class customer service for Emergency Restroom Trailer Rentals & Shower Stall Trailer Rentals in the state of Georgia. For over 10 years, Imperial Restroom has been at the forefront of the sanitary services business offering the cheapest, most affordable porta potty rentals and mobile restroom trailer rentals in Atlanta, Georgia (GA): Portable Bathroom Trailer Rentals in Columbus, Georgia (GA): Mobile Restroom Trailer Rentals in Savannah, Georgia (GA): Low Cost Bathroom Trailer Rentals for Weddings and Large Events in Georgia including but not limited to Sandy Springs GA, Macon GA, Roswell GA, Albany GA, Johns Creek GA, Warner Robins, Alpharetta GA, Marietta GA, Valdosta, Smyrna GA, Dunwoody GA, Rome GA, Peachtree City GA, Gainesville GA, East Point, Hinesville, Dalton GA, Newnan, Milton GA, Douglasville and many other communities in the Peach State. Imperial Restroom has offices in North Carolina which provide Emergency Mobile Shower Trailer Rentals in North Carolina as well as Emergency Shower Stall Trailer Rentals in North Carolina as well as Elegant Portable Restroom Trailer Rentals for Weddings in North Carolina. Imperial Restroom has the cheapest, most affordable shower trailer rentals in Charlotte, North Carolina (NC): Mobile Shower Trailer Rentals in Raleigh, North Carolina (NC): Low Price Mobile Shower Trailer Rentals in Greensboro, North Carolina (NC): Luxury Restroom Trailer/Shower Trailer Rentals in Winston-Salem NC, Durham NC, Fayetteville NC, Wilmington NC, High Point NC, Greenville NC, Asheville NC, Concord NC, Gastonia NC, Jacksonville NJ, Rocky Mount NC and a great many other cities and towns in the Old North State. Imperial Restroom Inc has offices in Connecticut providing the finest restroom trailer rentals for weddings in Connecticut as well as for emergency bathroom/shower trailer rentals in Bridgeport, Connecticut (CT), New Haven CT, Stamford CT, Hartford CT, Waterbury CT, Norwalk CT, Danbury CT, New Britain CT, West Hartford, Greenwich CT, Hamden CT, Fairfield CT, Bristol CT, Meriden, New England Restrooms & Mobile Showers, Manchester CT, Stratford, Milford CT, East Hartford CT, Middletown CT, Wallingford CT, Enfield CT, Southington CT, Shelton CT, Groton CT, Union CT, Bantam CT, Fenwick CT and many other cities and towns in the Constitution State. Imperial Restrooms is looking forward to exceeding your expectations in making your special event truly memborable with the comforts of home for your guests. For over 10 years, Imperial Restrooms has been helping people with event planning and execution. An Elegant Restroom Trailer Rentals adds the comfort and convenience of home to any outdoor event where running water and electricity may be scarce. Imperial Restroom Trailers are perfect for weddings, concerts, sporting events, races and outdoor events such as fairs, festivals and corporate outings as well as construction sites. Imperial Restrooms provides restroom trailers and porta potty rentals for home and commercial building construction, remodeling and renovations. Imperial Restroom Inc has one of the most robust selections of high end luxury mobile restroom trailer rentals, portable bathroom/shower trailer rentals and a large fleet of porta potty rentals for large outdoor events where facilities may be inaccessble or non-existent. The Restroom/Shower Trailers are heated/air conditioned and we have electric generators for electricity. Imperial Restrooms offers daily, weekly and monthly restroom/shower trailer rentals as well as long term bathroom trailer rentals. Imperial Restrooms are exquisitely designed and area equipped with facilities and amenities such as Vessel Sinks, Corian Countertops, TV's, DVD Players, AM/FM Radio and CD Players, Speakers, Heating and Air Conditioning Systems, Privacy Stalls, Hot/Cold Running Water, Soap Dispensers, Trash Receptacles, Vanity Mirrors, Men's & Women's separate restrooms for privacy. Call Imperial Restrooms for a Free Phone Consultation regarding the sanitary needs for your special event followed up by a free price quote for your particular restroom trailer and/or shower stall trailer rental. 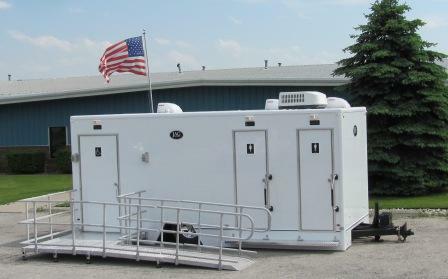 Largest Selection of Restroom Trailer Rentals! Call For Mobile, Luxury Shower Trailer Rentals For Your Event! ADA Compliant Handicap Shower Trailer Rentals!